Definition at line 17 of file HttpHeaderData.h. Definition at line 29 of file HttpHeaderData.cc. Definition at line 32 of file HttpHeaderData.cc. Definition at line 97 of file HttpHeaderData.cc. 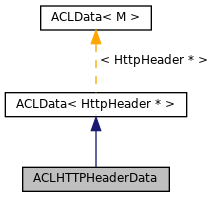 References ACLHTTPHeaderData(), ACLData< M >::clone(), hdrId, hdrName, and regex_rule. Definition at line 60 of file HttpHeaderData.cc. 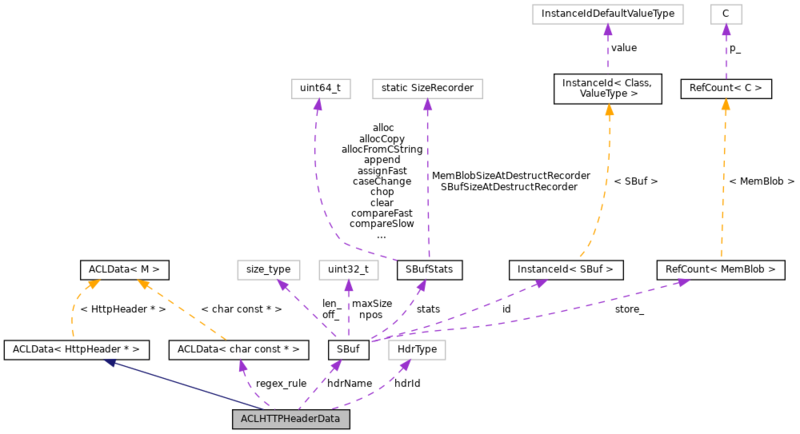 References ACLData< M >::dump(), hdrName, and regex_rule. Definition at line 91 of file HttpHeaderData.cc. References Http::BAD_HDR, ACLData< M >::empty(), hdrId, hdrName, SBuf::isEmpty(), and regex_rule. Definition at line 38 of file HttpHeaderData.cc. References Http::BAD_HDR, debugs, HttpHeader::getStrOrList(), HttpHeader::has(), HttpHeader::hasNamed(), hdrId, hdrName, ACLData< M >::match(), NULL, regex_rule, and StringToSBuf(). Definition at line 69 of file HttpHeaderData.cc. References SBuf::caseCmp(), cfg_filename, config_input_line, config_lineno, DBG_CRITICAL, debugs, hdrId, hdrName, Http::HeaderLookupTable, Http::HeaderTableRecord::id, SBuf::isEmpty(), Http::HeaderLookupTable_t::lookup(), ACLData< M >::parse(), regex_rule, and ConfigParser::strtokFile(). Definition at line 31 of file HttpHeaderData.h. Referenced by clone(), empty(), match(), and parse(). Definition at line 32 of file HttpHeaderData.h. Definition at line 33 of file HttpHeaderData.h. Referenced by clone(), dump(), empty(), match(), parse(), and ~ACLHTTPHeaderData().